The NES Classic Mini comes out this week, and appears to be getting just as much third-party accessory support as as full-blown Nintendo console. We've already seen Nyko and EMiO's range of controllers, and now My Arcade and Hyperkin are getting in on the act with more accessories. 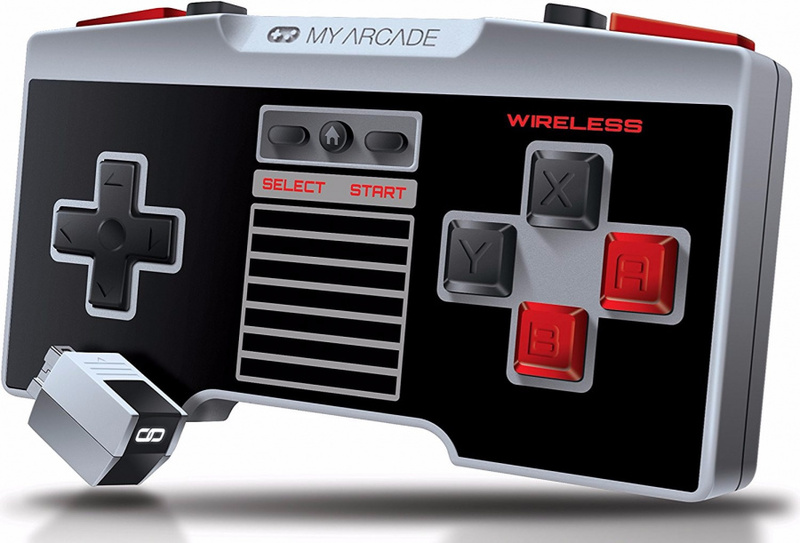 Retro gaming accessory brand My Arcade has the Gamepad Classic, Gamepad Pro and Gamepad Retro on offer, as well as a combo kit and extender cable. + Gamepad Classic (MSRP: $14.99): Features wireless connectivity from up to 30′ and play time of over 75 hours. The Gamepad Classic retains the same iconic 2-button layout as the original NES controller, combined with a new, ergonomic design. + Gamepad Pro (MSRP: $19.99): Featuring both wireless connectivity from up to 30′ and play time of over 75 hours; the Gamepad Pro will allow gamers to revisit their favorite NES or SNES games with 4 face and shoulder buttons. + Gamepad Combo Kit (MSRP: $24.99): Everything you and your friends need to play your NES Classic Edition in comfort. Includes a 10′ extender cable to extend the length of the controller included with the console and the Gamepad Classic wireless controller for multiplayer games. + Gamepad Retro (MSRP: $12.99): Designed for gamers seeking the classic styling and nostalgia of retro controllers, but with improved ergonomics and a longer range. This controller includes a 10′ cable for comfortable play from longer distances. + Extender Cable (MSRP: $9.99): A 10′ extension cable to make playing from the couch possible on the NES Classic Edition. The Extender Cable is also compatible with the Wii and Wii U. All of My Arcade's controllers and accessories are currently available for pre-order on Amazon in North America. Meanwhile, Hyperkin is releasing an adapter which allows you to use your original NES pads on the NES Classic Mini, as well as an extension cable similar to the one sold by My Arcade. Pre-orders are open now. Will you be picked up any of these, or do you prefer to go official with this kind of thing? I'll just use the included NES controller and my Wii Classic Controller Pro's. Oh my, that is one ugly piece of plastic. I always hate it when companies think they need to "improve" upon the original buttons. Official controllers or bust. You're either a true retro gamer or you're not. Too bad getting up every time to hit the reset button for either changing game or creating a restore point makes the extension a bit unless. Or are they going to make a Reset Button controller you plug into the second port? I'll get the extender cable, either this one or Nyko. But I'll stick with the original controllers - official or bust! The extender cable will be good because you can also play wii sports box without break the tiny cables, haha. I like the wireless nes snes type controller, but the design is ugly. Yeah, the original controllers are the only option for me. Would be nice if the article actually provided links to the product pages for amazon, etc. @getyourak It does,click on the red words near the end of the article. @Randomname19 The amazon link is a direct link to the home page of amazon. How is that helpful? The other link is for only some of the product mentioned. You know this is cool and all, but considering how the mini is a closed system with a limited number of games (albeit lots of gaming hours and fun!) I don't see the WANT (although I do see a need) in investing more than the base set. I'm skipping this one in hopes that Nintendo releases an SNES mini (such love), but I kind of wish Nintendo made this thing with the possibility of buying more games from a VC eshop, oh the possibilities.... On that note, I also wished they would have released a full on retro box, that you could either buy games individually over eshop or pay a monthly subscription for all VC access. @RoomB31 Adding online capabilities or VC/eShop is not the purpose of a device clearly meant as a pure retro device. Hence also the wired controllers. Back then we had no internet and only very few wireless controllers. The Classic Mini is meant to reproduce the gaming experience we had back then, not to offer us a separate download box. VC titles and such can be acquired on Nintendo's regular consoles and handhelds. The My Arcade pad looks alright. I don't trust hyperkin's controller quality though. The buttons always wear out and become mushy too quickly. Nyko's usually pretty solid. the UI isn't exactly retro, save states and all... So it's not exactly doing the job 100% if you want to stay on point. This is all a suggestion, as a means to pursue other options. If people knew they could find all classics in one spot it would create a new customer, the same one this box is going after. People are not buying Nintendo's regular consoles primarily to play classics. @RoomB31 The menu and save points are a small added bonus for convenience and to make up for the lack of physical cartridges, so that's not a very strong point for your case. Neither are display options or connections, since these are simply to provide a means of connecting the device to a modern TV and to still give you the option of playing in the original screen mode. Eh. 3rd party controllers can be so touch n go. I'll be picking up externder cables and use the included NES controller and one of my wii classic controllers, which already has an NES skin. @SanderEvers No reason that the 8bitdo wouldn't work with the Hyperkin retro adapter. @Mart1ndo called something you can't really buy anymore, and my point was retro focused, not VC as a bonus. @ThanosReXXX obviously I wouldn't be contesting av components, that's illogical. however, not all games had the ability to save, passwords were a big (annoying) part of the NES days. So the save feature does change the experience quite a bit. I'll wait for a month or so to see if any extender cables like this (i.e. black and of decent looking quality) become easily available to order in the U.K. If not, and I find I really need them, I'll order them from the US. Mmkay. Why the need for that many buttons? Its d pad, a,b select, start. Odd design considering the NES mini is NES only titles. The connector is adorable though. I could see getting the extension cables but not the off brand controllers no matter how interesting that they look. Considering it is next to impossible to even get the actual console itself (unless you pre-ordered many months ago / or are prepared to spend big bucks on a scalper's stock), most people will not be getting any of them. Whether they want to or not. @ThanosReXXX Thanks man. Yeah I already have several long hdmi cables, although I'll also need a suitably long USB for power too. I'm getting the cables to let you use the original joysticks. And that brings a smile to my face on an otherwise god awful day. @samuelvictor That is true, and it does make you wonder. Ordering stuff from the States shouldn't take more than 10 days, though, so if you order now, you'll have them in no time. You could also try DealeXtreme, a site that I previously forgot to mention, and they have free shipping worldwide. Currently, they only have these white extension cables, and they are also temporarily sold out, but at the very least it is a site to add to your favorites, because they have a lot of interesting stuff, and ridiculously cheap too. If I can even GET an NES Classic, I'm kind of interested in wireless controllers. Unfortunately, my experience with Bluetooth controllers is that the inherent lag makes some games much more difficult to play. I suspect that Castlevania, for instance, would be much more challenging with the MyArcade wireless controller. @ThanosReXXX Do I still count as impatient if I point out I've been looking forward to opening a new NES since the late 80s? Thanks for the link though, I'll have a browse - also didn't know you could go from SCART to HDMI, that could prove quite useful! @samuelvictor Well you can, and it even does some upscaling on large screens. Don't expect anything miraculous, though, but the image is good enough. This is the one I bought for my father and as you can see, it has a 720p/1080p upscale switch. I don't know if that's meant for display on HD-Ready or Full HD TV's, or just for different upscaling options depending on the size of your screen, but either way: it works like a charm. I did notice they only have devices with a EU or US plug, so you'll possibly need an adapter to connect it to a wall socket. Fun fact: they also have these little gizmos with conversion the other way around. In that case, there's no upscale switch, but you can connect HDMI devices to your old TV set that has no such connection. @samuelvictor Aha, interesting. I assume these don't have component cable options, but if they do, that's the better option compared to this, and most modern TV's still have component video and audio sockets. The one I bought does the job for viewing, and my father is not really the most critical person in the world, but if you want to capture and digitize footage from older devices, then you might want to step up the game with some more professional equipment with multiple options and connections, and the page I linked to shows an overview of all the relevant devices they have. @samuelvictor If it's Super VHS, then there should also be an option to connect via S-Video connectors, and these give better quality video than SCART. The more elaborate convertors also have S-Video connectors so if your videos have that option, use that instead of SCART. I did tonnes of research before I bought it, and back then, the internet was all but non-existent, but luckily, I had friends in the right places (stores, dealers etc.) to give me the right advice based upon my specific wants and needs. It's Super VHS, has double the amount of heads of a regular VCR (for smoother and more steady playback), Hi-Fi, even has an option to record dual audio broadcasts and most importantly: it's region free, which was what I was looking for back then because of my anime addiction. I ordered a lot of stuff from the States back then, and there was something extremely cool about being able to play NTSC cassettes on a PAL system. By now, it's almost 15(!) years old, and it still works like a charm, but then again: I'm also very caring about all my video and gaming equipment. I've had it sent away only once, for a big clean up and revision, but since then, it's safely nestled underneath my TV, for the occasional anime evening or some self-recorded series/movies. There's something strangely appealing about fast forwarding with stripes and bands. Although probably only to old-timers like me.. It cost me a hefty 699,- but I'm not quite certain anymore if that was guilders or euros, since it was right before the introduction of the euro in the Netherlands, and I took a credit arrangement with the store to pay for it, so the currency was probably already in effect by then. Either way, it was a lot of money for a VCR, but considering it's current state especially, it was more than worth it. And they are still sold to this day. If you can still get your hands on one, I can heartily recommend it, even a refurbished one. It truly is the best VCR I've ever owned, and I've owned quite a few, from all different kinds of brands, but this one beats the crap out of them all. There's also a sibling model, the JVC HR-S6600EU. Don't know what the difference is, though. I even checked the manual just now (which mentions both models, but doesn't mention any specific functions for either) Might be that either one of the models is more readily available, though. As for prices: I've seen them refurbished for around €200 - €245. You can check the site I took the photos from. Currently, they're out of stock, although they do still have some other Super VHS VCR's, also from JVC, so I reckon these will be equally good. Or you could always send them an email to ask about them possibly becoming available again. The prices seem fair and they give a full year's warranty. And they are an actual shop. I'm not much of an eBay or other online market buyer. I know that there are also shops on there, but still, I'd rather go for the professionals straight away. But maybe the model I have comes back in stock, or perhaps you come across it on some other site. @samuelvictor Haha, yeah. Always funny to look at the stupefied faces of kids if you have to explain to them that you had to rewind the movie afterwards. Don't know about your experience, but over here, rental shops were quite strict about that, and even checked when you returned the tapes. If by obscure movies you mean those horribly acted B (or probably even C) movies, then yes. Although nowadays, I do watch the odd art house movie every now and then. @samuelvictor And yes, there were Sega vs Nintendo clashes, but compared to nowadays that was completely nothing. That was tickling, this is full on fighting and wishing the others the worst you can think of. Well, at least: that's my experience over here. As for now, TBH I'm mostly a Nintendo, retro and occasional PC gamer so I don't hear much of the infighting between Sony & MS fans. During the DC/GC/PS2/XB era I owned all 4 consoles, but I did definitely move away from Xbox live due to the general abusive nature of people over voice chat though! @samuelvictor Well, what I was actually talking about is the animosity of the other two fan bases towards Nintendo gamers. And even self-proclaimed Nintendo fans against other Nintendo fans. There are more than enough negative Nancy's on this site too. On Xbox Live, I only ever played with friends, so I never got bothered by overly abusive idiots. @Angelic_Lapras_King It's got a 'Home' button on it which will act the same as physically pressing the reset button.